As young Copper grows, she finds an unexpected best friend. The lifemates rendezvoused as they had agreed they would, along the banks of Badger Lake where the ancient willow grew. Trailed by his wolf-friend Flea, Farscout arrived at moonshigh with a gathering basket under one arm and newborn Copper nestled in a websilk sling across his chest. Shortly thereafter, Brightwood rode up astride her she-wolf Redbrush, her bow in hand and a brace of fat hares slung across her shoulder. �It feels wonderful to move again,� Brightwood said. She handed the brace of game to her Recognized, then untied the shoulder of her sleeveless tunic. �You can't know how really, really good it is to stretch my legs and run again, after waddling around baby-fat for so long!� She took Copper into her arms and offered the babe her breast, and the newborn set to work at once, needing no encouragement. Brightwood sighed in pleasure and sat back, dangling her feet over the bank into the cool water below as she nursed her child. �Has Copper been crying at all?� she asked, stroking the downy curve of the newborn's head. �Enjoy that while it lasts,� Brightwood said wryly. �Hai!� she said sharply then, as Redbrush bumped a hip hard against her. �Take that the other way!� she chastised her wolf. Redbrush turned a shoulder away from her rider and the nursing infant, but otherwise stood her ground, a growl rumbling from her chest and both her ruff and tail raised aggressively as Farscout's Flea slunk low before her in a submissive crouch. Flea licked at Redbrush's bloody muzzle and whimpered like a hungry pup, begging for a share of whatever meal the other she-wolf had recently eaten. Farscout shared a glance with his lifemate, then untied one of the hares Brightwood had caught. Farscout drew the knife from his belt and deftly separated one of the rabbit's haunches, which he offered to Redbrush. Once the dominant wolf had her due delivered, Farscout tossed the remaining carcass to his she-wolf. Flea pounced on it eagerly. Redbrush gave a fresh snarl as Flea approached her again. Braving Redbrush's wrath, Flea dropped to her belly and crawled forward, ears flat and eyes averted, the dead hare hanging limp from her mouth. �Off,� Brightwood said, giving Redbrush a push in the ribs with her elbow. Redbrush backed away, clearing the way for Flea. The black she-wolf took that opening and inched further forward, whimpering submissively as she dropped the bloody carcasses in Brightwood's lap. �You don't need to feed me!� Brightwood laughed, tossing the hare back. Ears still at half-mast, Flea picked up the carcass again and offered up her prize hopefully. �Love, it's not you she's trying to feed,� Farscout observed. Brightwood laughed again as she took the hare away from her lifemate's wolf-friend. Flea backed away, then sat watching Brightwood and her nursing infant expectantly. Flea panted in satisfaction, then settled with her head on her forepaws, her amber eyes never straying from the babe nursing at Brightwood's breast. He held out the pulped passionberry patiently. He could see the eagerness in Copper�s eyes as she focused on the red treat. She held out her hand, fingers outstretched. Farscout smiled gently and waited. The look he got was displeased, and there was a soft angry sound to go with it. Evidently resigned to the effort, Copper resolutely set about crawling over to her father and reached up again. Farscout waited patiently as his girl pulled herself to unsteady feet, grabbing the leg of his pants for balance as she reached up for her reward, but promptly flopped back down onto her bum to enjoy it. Copper would be walking soon, Farscout knew. And when she was, gathering would become a whole lot more difficult. He moved on to the next patch of the low-lying plant and knelt while picking the berries. Copper�s soft almost-words fell to laughter as Flea rose to her feet and pushed her muzzle into the cub�s face, swiping at her berry-stained face with a wide, wet tongue. Copper fizzed and burbled at the unexpected bath. Farscout smiled at the sight, then turned back to the passionberry patch, picking another few of the ripe berries before other creatures could get at them. A pained whine made him turn back. Flea looked up at him plaintively. Copper was clinging to Flea�s tail, her chubby fingers fisted tight. Flea�s long legs were splayed out to brace against the cub�s weight. Flea took a cautious step towards Farscout, and Copper actually echoed the movement, lunging unsteadily from one foot to the other, still catching most of her weight dragging on Flea's tail. Copper stumbled, recovered with a yank after Flea, and then stood wobbling on her bare feet, clearly pleased with her own first steps. Flea stood patiently, only her half-masted ears betraying any discomfort. Another wolf might well have snapped. Farscout held out his hands for his girl cub, and Copper let go of Flea with one hand outstretched toward her father. (Or she was demanding more berries. One of the two.) Farscout put aside his basket and moved to reclaim his daughter. He reached out for Copper, and she hesitantly reached back for him, but loosening her grip on Flea�s tail was enough to unsettle her. Not balancing on her own yet, she began to fall � and just as quickly, Flea moved to the rescue, sweeping her tail and a hip within reach of the girl-cub's failing hands. Copper nodded, her face set in an expression of solemn concentration. Flea had automatically begun to turn in toward the center of the meadow, following after Farscout as he backed away. Copper tugged at the she-wolf's black ruff with both hands and rocked her weight back on her seat. Flea stopped obligingly, then when Copper thumped her heels against the she-wolf's ribs, she moved to amble in a wide egg-shaped orbit around Farscout. The children of the tribe learned to ride as they learned to walk. But learning to ride a wolf beyond a walking or trotting gait wasn't an easy thing to do. A wolf's spine was a flexible, rolling thing, as sinuous as a snake and in no way built for the ease or comfort of a rider. Remaining astride a running wolf, as each of its leaping strides created a whip-like forward snap, was difficult enough on steady, level ground. And a pack rarely ran a steady, level course when chasing forest-dwelling prey on the hunt. Young elves learned to fall much more reliably than they did to ride fast when riding without an experienced elder to keep them in place astride a wolf-friend. 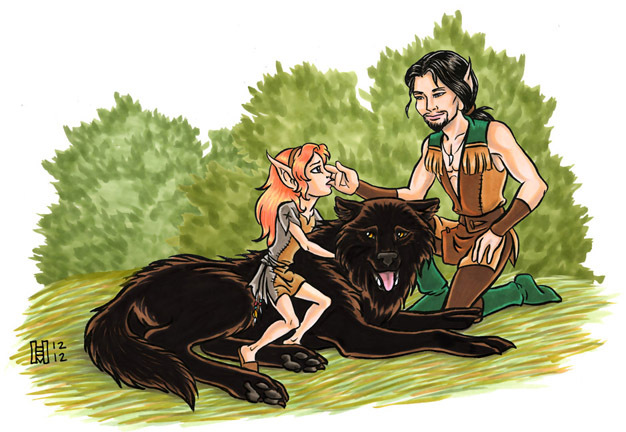 Most elf-children didn't really master the art of riding solo until they were old enough to bond with their own wolf-friend, and that wolf-friend had then matured the year or so it took for a wolf to safely carry a rider's weight. It was a learning curve for both wolf and rider. But Copper was determined. She had her mother's taste for riding fast, and her father's Flea was indulgent enough of her wishes to carry her, when Redbrush's patience with ruff-yankings and rib-thumpings from anyone but Brightwood was brittle and thin. Flea circled the meadow at a walk, her tail carried high in self-satisfaction. Farscout nodded to himself as he watched his daughter complete that first full circle. �Show me a trot,� he said then, and Copper tapped her heels against Flea's sides. Flea eased smoothly into her ground-eating trot, doing her best to cushion the child. To Farscout's eyes, it was clear that his wolf-friend was very self-conscious of the precious burden she carried. A second circuit of the meadow then; this time, Copper nudged Flea's nose closer toward the meadow's clearing, where the length of a young tree lay, felled by slaptails that winter past. Flea gathered her legs up high to clear the obstacle in what was hardly more than a hop, creating as little challenge as possible for her young rider. But Copper still swayed dangerously forward and back in reaction to that gentle jump, and when she didn't fall, the brief smile she flashed to her father was effervescent with accomplishment. Farscout watched Copper pop Flea over that low jump one more time before nodding his approval. �A lope, then,� he called. Copper gripped Flea's black ruff tight in both hands and asked her mount to increase speed. Flea loped forward, her expression no longer relaxed and easy. Farscout could see how his she-wolf was taking care where each step fell, cautious about creating any sudden jolt that might risk Copper's balance. The she-wolf tried to shift inward toward the center of the meadow, but Copper corrected her at once, turning the black wolf back into her previous course. Farscout almost intervened, but restrained himself. He watched knowingly as his daughter pointed Flea's nose toward the young fallen tree, and insisted that Flea jump it. Wolf and rider almost made it. Almost. Copper had ridden jumps safe in the arms of her parents before, her body knew what to expect; likewise, Flea was achingly conscious of her young rider's balance and made every effort to stay with the child. But the whiplash force of Flea's landing after even what was a low and gentle jump proved to be too much. Copper lost her balance and tumbled off and over Flea's shoulder. Farscout wasn't conscious of moving � he simply was there, kneeling at his child side as she lay in the grass. The girl gamely pushed herself up to her knees, panting after the wind she'd knocked from her lungs. Flea jostled against Farscout's shoulder, whimpering as though she herself had taken the blow. �I fell,� Copper said needlessly, letting Flea lap anxiously at her face with the wolf's long, pink tongue. Farscout fondled Flea's broad head, soothing his wolf-friend's distress with a touch and a wordless wolf-send of praise. Flea shook herself, waited for her young rider to settle, then patiently accepted Copper's request to begin the riding lesson again. �Cubs, get back over here,� Farscout said, his soft voice carrying along the riverbank. Cloudfern looked up from his berry-picking to see Cinder and Copper obligingly turn away from the old capnut tree, but Rill stood his ground. The yellow-haired boy was fishing his slingshot from his belt as he squinted up into the heavy branches overhead. Cloudfern shook his head in amusement, wondering if Rill were exercising the obstinate, willful side he'd inherited from his mother, or the obstinate curiosity he'd inherited from his father. Either one was apt to exhibit selective deafness when the whim struck. �Rill,� young Cinder said in exasperation, while Rill put an acorn into the slingshot's leather cup and began to take aim at something high above. Cinder pivoted to grab his friend's arm, while Copper turned back a step as well to see what was going on. �**Cubs, come here. **� Farscout's request was now a sharp command, sent as well as spoken. Cloudfern was aware that his soul-brother had put down his gathering basket and was moving toward the capnut tree. Flea trotted past them both, her ears flat and her body language uncharacteristically abrupt. �Cubs, right now--� Cloudfern said, only a step behind Farscout and intending to intervene. Whatever the cubs had treed, Flea certainly scented trouble. Rill let his missile fly. Something shrieked and dropped like a stone out of the tree. Something even larger followed after it, squawling and spitting with fury. Rill yelped and bolted, knocking hard into his two playmates and nearly spilling all three of them to the ground. Flea roared and vaulted over the children, colliding headlong in a tangle of bristling hair and fangs with what sounded like a furious mother ringtail. Fur and spittle flew. A second adult ringtail came boiling down the tree trunk and launched itself into the combat just as Farscout reached the cubs and swept all three of them up in his arms. Cloudfern caught after his soul-brother's shoulder and put his own body between Farscout, the children, and the fight, while the rest of the ringtail brood overhead hissed and chattered from the capnut tree branches above them. Ringtails were sometimes comical-looking creatures, but they were wickedly mean when provoked; Cloudfern had once seen a ringtail maneuver a grown wolverine into the river, where it clung to the wolverine's head and drowned it. The female ringtail was wrapped around Flea's head now, snarling in great exhalations of fur. For her own part, Flea was rolling and thrashing, just trying to get enough of the ringtail's grip loose to sink some teeth into the beast. The male ringtail came jumping broadside into the fray, making an earsplitting racket as he looked for an opportunity to take some hide of his own. Cloudfern swung his berry basket hard, oblivious to the scatter of dark ripe berries as he knocked the male ringtail back against the capnut trunk. Cloudfern's wolf-friend Crowsong arrived then, fangs flashing as he bounded into the fight. The male ringtail turned tail and scrambled up the trunk of the capnut, at the heels of the dazed younger beast Rill had knocked out of the tree. The female ringtail launched from Flea's head and shoulders and made it up halfway up the capnut tree before Crowsong's teeth scored her tail. Reunited, the entire brood continued to make a threatening racket from the branches overhead, raining down a spatter of leaves and woody debris. �Flea!� Copper sobbed, trying to squirm from her father's arms as Farscout carried all three children away from the angry mob of ringtails. �Flea!� Cloudfern followed, not noticing he'd burst his basket until they reached the relative safety of the meadow. Crowsong and Flea joined them. Crowsong stood a fierce-eyed and snarling rear guard, while poor Flea stood, head hanging, looking like something chewed up and spat out. Her head and shoulders were lacerated with bite wounds, her poor ears were ripped to shreds, and blood dripped from what would be an especially painful cut across the broad, soft pad of her nose. She moaned and muttered to herself as she cast an anxious eye back toward the capnut tree's noisy occupants. As soon as Farscout put the children down, Copper rushed to Flea. Cloudfern grabbed the girl by the shoulders and restrained her, knowing better than to trust an injured wolf. Copper sobbed and reached out for Flea, and the she-wolf turned toward the child. Flea's poor, shredded ears dropped to half-mast, and she carefully nuzzled Copper's hands, assessing for herself that her rider's girl-cub was unharmed. Farscout knelt beside them as Copper carefully embraced Flea's torn and battered head. Flea thumped her tail in agreement to that assessment, and lapped the tears from Copper's face with rapt devotion. Copper�s eyes burst open in terror. Her heart was beating as fast as a racing wolf. An uncomfortable sheen of sweat clung to her body. Her hands curled into ineffective claws as she fought her way out of the fur she�d cocooned herself into and scrabbled against the warm wood of the bedbowl, clutching at the solid surroundings. She kicked off the rest of the furs before they could choke her like strangleweed, flailing and pushing them closer to her parents. The girl-cub sat up and tried to catch her breath, trying to get as much air as she could, like she�d been underwater too long. The reality of the den around her was comforting, steady. A warm glow from the daylight seeped in through the edges of the door, chasing some of the nightmare away. The hair on the back of her neck was still standing on edge and she soon had to rub the chill away from her arms, despite the damp sweat. She wasn�t in the mountains, she wasn�t going to be eaten by a giant rock-creature. No matter what Crackle said, mountains didn�t have teeth. Her father had said so. And he�d assured Copper of it the last time she�d had this nightmare. And he probably would again, if she crawled in between her parents and woke them up. But they would tell her to go back to sleep and that it was just a dream, but it wasn�t, it was so real! Copper caught her breath and tried to stop the frustration that might become tears if she woke either of her parents. Still far too on-edge to sleep, she climbed out of bed and pulled on her favorite tunic-dress. Innocently confident of her sneaking skills, she didn�t turn back to see that she had indeed woken Farscout as she slipped into the golden sunlight outside. So bright. Copper rubbed sleep from her her eyes as she carefully picked her way down the stairs which spiraled down around the body of the Mother Tree. Giving the distant mountains a glare that was only partially due to the bright daylight, Copper stepped off of the tree root and ran through the trees towards the grassy knolls where the low-ranking wolves slept in the summer heat. Copper�s eyes flicked over the lumps of fur until she saw the one she�d set out to find. �Hi, Flea,� she whispered to her father�s wolf. Flea�s black fur had warmed up in the sunlight. She twined her fingers through the rough overcoat. Flea sighed contentedly. Copper gave a small smile. Flea wouldn�t tell her it was just a dream. Flea knew how real dreams were. Copper had seen the she-wolf trying to run in wolf-dreams before! After Flea sniffed her over, the wolf let her head flop back against the grass, still full and lazy from a large meal the night before. Copper pressed her face into Flea�s dark fur, the warm earthiness of the wolf-scent chasing away the memories of the cold barren mountains. Slowly, still fighting sleep, the cub�s eyes closed. Sunset had come. It was time to go. Farscout slung his carrysack over his shoulder, automatically adjusting the press of the strap that crossed his chest to ensure it did not interfere with a reach after his quiver. Brightwood stepped up close to embrace him. He held his lifemate close and nuzzled her cheek, breathing in her scent deeply. �You're ready. No reason for us to make a fuss about it,� Brightwood murmured as they parted. He nodded in agreement. His Recognized was right. He had been leaving the Holt on patrol on nights like this for more years than he could count. Tonight was only different in that it was the first time since Copper's birth. Five summer solstices had passed since then, five years of being rooted in place. Leaving for long patrol again should not seem so difficult to do. Copper hung back against the trunk of the Mother Tree, her small face set with a frown. She was accustomed to her mother being the one to leave for days on end � but this would be the first long parting from her father. Brightwood set her hands on Copper's shoulders when Farscout put their child down again. Creating no drama over these partings � to say goodbye and go without a look back � it was an old ritual between them, one which stretched back to their shared childhood, and partings between Lynx and Frost. But from her lingering look, Farscout could tell that his lifemate was finding this one parting to be unexpectedly difficult as well. He met her gaze, gave her a half-smile and a nod, and turned to go. Flea stood to the side, watching with clear dismay. Farscout gestured to her, summoning her to his side as he strode away. Instead of coming to meet him, however, the she-wolf dropped to her belly and turned her head aside, refusing to look at her rider. Farscout stopped. He turned toward the she-wolf again, summoning her now with a wordless wolf-send. He pictured them together, walking deep in the forest, the moons rising behind them and the distant scent of the sea beckoning them on. �What's wrong?� Copper said again, looking at her father for an answer. Copper's frown grew troubled, but she continued to embrace the she-wolf tightly. Farscout couldn't set his feet walking again, not without resting a hand against his daughter's red-gold head for a moment. **You can't go on a patrol without a wolf-friend,** Brightwood said, disgusted with Flea's betrayal, but knowing better than to challenge it.